It seems that everyone is adding their name to the ‘green list’. This is not only good for the ecology of the world, but its good business sense as well. Consumers are basing their purchasing decisions on those companies that have made concerted efforts towards less pollution and a healthier planet. While there are some companies that may be making ecology choices bases on the trend, other companies stand out for their own individuality in pursuing their green efforts. 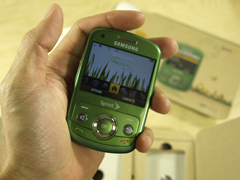 Sprint made a conscious decision in 2007 to begin research into a ‘greener phone’. It seems this was more of a challenge than they thought, because they were the first to enter into this visionary concept. You have to admit, this is an impressive list. It proves total commitment by Sprint to undertake a lofty goal of ensuring that every aspect of the mobile phone device involves environmental thought. This includes the achievement of gaining the commitment from all of their partner companies that are involved in the cell phone process. Sprint set a precedence that eventually set the standards for all mobile devices throughout the world. The set specifications as outlined in a variety of industries including: the Energy Star guidelines, Restriction of the use of Certain Hazardous Substances (RoHS), Forest Stewardship Council certification, EPEAT (Electronic Product Environment Assessment Tool ), Greenpeace Green Electronics Guide, Waste Electrical and Electronic Equipment (WEEE) Directive, and others. Each partner company and/or vendor that Sprint worked with has been required to comply with all environmental guidelines that they have established. But, it doesn’t stop there; Sprint has a quarterly evaluation ‘scorecard’ for each of their vendors and partners. The surprising fact is that all of the vendors/partners that are associated with Sprint have eagerly complied, as they also want to add their names with corporations that are contributing to a healthier planet. The Sprint-Eco logo is added to devices that excel past the ecological specifications of their eco-criteria. Sprint has proven themselves as a leader in the telecommunications field but they have elevated their company standing to lead the way for all organizations to take their own initiatives towards environmental health. There are few companies in this day and age that have set out on such a venture for the sole purpose of being earth-friendly. Posted on February 27th under Global Ecology, Saving Our Planet.